Stanley McChrystal spends a lot of time writing these days. The retired four-star U.S. Army general used to be in charge of Joint Special Operations Command (JSOC), launching teams of Navy SEALs, Rangers, Delta Force and other specially trained warriors on top-secret missions, hunting terrorists throughout Iraq. Then he was in charge of all U.S. forces in Afghanistan, where he started a counterinsurgency that eventually led to the mission that killed Osama bin Laden. But an infamous 2010 profile in Rolling Stone included remarks from the general and his staff that disparaged officials in the Obama administration, and McChrystal resigned as a result. Now 61, he stays busy with other things, adapting to his new environment. He has a leadership consulting company, the McChrystal Group, based in Alexandria, Va. He teaches international relations at Yale. He chairs a committee at the esteemed Aspen Ideas Festival, where journalists, innovators, politicians, diplomats, entrepreneurs, artists and writers flock yearly to discuss a better future. He flies all over the world, giving speeches to think tanks, corporations and universities. And he writes. He blogs about business on LinkedIn. He pens forewords and introductions to books he admires. He just started a new project, a foreword to a book he’s loved for 40 years, he says. And he recently published a second book of his own. 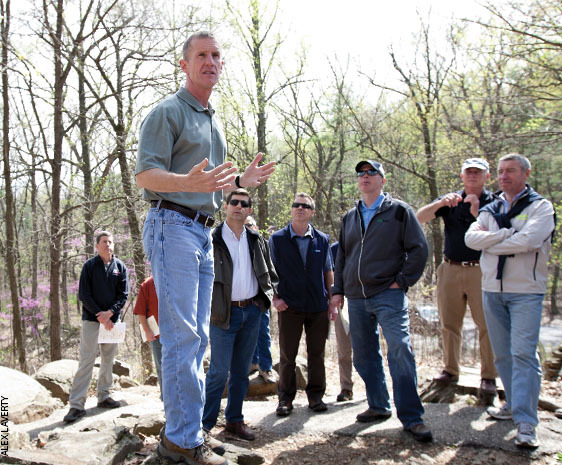 McChrystal usually writes on trains or planes or when he’s alone in a hotel room. Anywhere he can get a few hours of quiet to think. He’s very specific about his process, and he loves talking about the different ways people accomplish tasks. First he writes a draft he calls a “30 percent solution.” He calls it that “because it’s 70 percent not good.” That’s usually enough for him to get his mind around an idea, though, and to see where he should be going with something. Then he crafts it or, as he puts it, “I wrestle with it for a while,” reworking and rearranging his words until they have just the right effect. That’s his favorite part, the editing and rewriting. He thinks of it as sculpting. 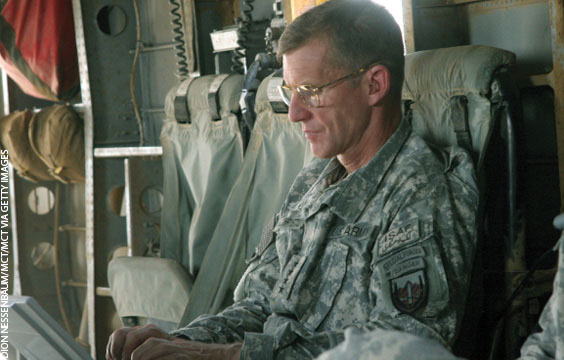 McChrystal has always been drawn to writing. When he was in fifth grade, he was put in a special class taught by a creative-writing instructor, and he loved the exercises they’d do. As a senior in high school, he wrote a 179-page paper about America’s decision not to interfere with the 1954 French colonial struggle in Indochina. 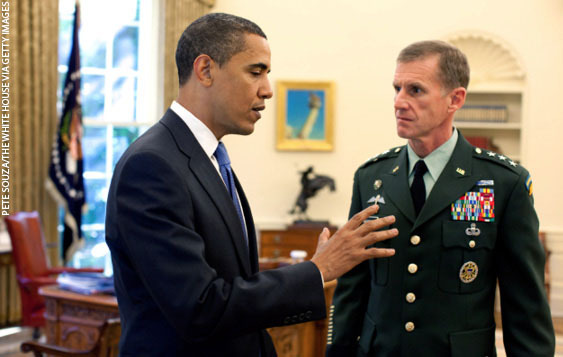 At West Point, McChrystal was the managing editor of the literary journal and published several short stories. One was about a soldier who kills a man he mistakes for a terrorist. When working on a project, he applies the same intense focus that served him for more than three decades in the military. As soon as he’s done with his morning workout, he starts knocking out the day’s most difficult tasks. He might start at 8 a.m. and write until noon or 1 p.m. And he tends to work on whatever he’s writing every day until it’s done. McChrystal’s new book, released late last year, is called Team of Teams: New Rules of Engagement for a Complex World . Written with a handful of partners, it’s about the strategies he implemented to transform the U.S. military and how they can apply to businesses anywhere. The book’s title hints at his proposed solution to most problems: well-equipped groups that communicate effectively both within the group and with other groups. If you proposed a formula for a successful business book, it might look like this. Team of Teams has a popular retired general and his team of former Navy SEALs and Yale academics writing about the ability to quickly adapt to changing environments, citing examples from popular culture and the grit of war, with a foreword from Walter Isaacson, who’s known for his best-selling biography of Steve Jobs . 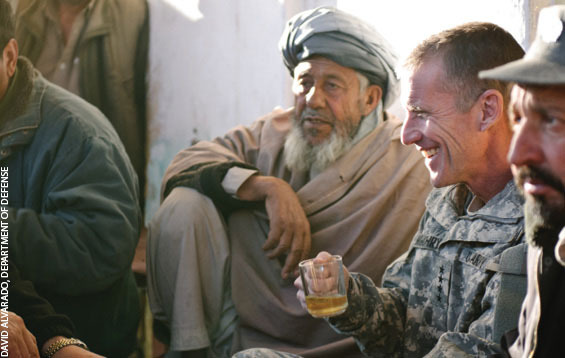 In deep conversation about the book, about his views on the world, McChrystal first makes it clear that he prefers to be called “Stan.” As the talk continues, a steady stream of email pours into his inbox, each dinging as he speaks. He transformed our fighting forces in Iraq, the approach to insurgents, and the way special operations forces like the Navy SEALs do their jobs. He was in Iraq in 2003 when things began to get bad, when Americans began to realize the nation was in for a prolonged fight. By the time he shifted his attention to Afghanistan in 2009, the situation in Iraq seemed to have improved dramatically. In his book, McChrystal explains that many of the strategies and approaches the military employed to fight the terrorist organizations in Iraq are directly applicable to civilian business leaders. It’s about the ability to respond rapidly and correctly and about the need to adapt in a modern way. McChrystal knows all about dealing with change. There’s something about the way he talks, the way he explains things, that makes you feel smarter. He likes thinking about the abstract, the vague entities and hypothetical businesses. He certainly doesn’t consider himself an intellectual—his wife says he took her to a fast-food restaurant while she was wearing an evening gown—but he’s fascinated by the way things happen. A certain detached curiosity drives him. He’d rather read about artificial intelligence than talk to a stranger any day. He has been that way for as long as he can remember, he says… the kind of kid who spends a year researching a single historic foreign-policy decision. He grew up in the military, the son of a general, but he also has something of an anti-authoritarian streak, even before it (arguably) got him in trouble. His disdain for useless codes and antiquated habits made him beloved among the troops in his command. His philosophy has evolved over time. McChrystal saw this up close. He was out for a run at Baghdad International Airport in early 2004 as rockets fell all around him. That’s when something occurred to him. He saw terrorists on different sides of the country communicating faster than similar groups ever had. Terrorist organizations traditionally had been tightly controlled and disciplined, with slow, safe communication that often made the groups more ponderous. Technology allowed these new groups to exploit American weaknesses with crippling precision. This is one of the first lessons he believes leaders and entrepreneurs can learn from his experience. Most businesses focus on efficiency and predictability. In the past, those are the factors that led to growth. He equates this process to Darwinism. He persuaded disparate American and international organizations to share information in an expeditious, easily accessible way. It wasn’t a new notion but hadn’t been done effectively up to that point. McChrystal talks about how U.S. forces had “16 or 17 different little bases” around Iraq, and each base was fighting insurgents in different ways—some of which occasionally conflicted. He brought more leaders into morning briefings and tried to push information—not orders—down the chain of command. 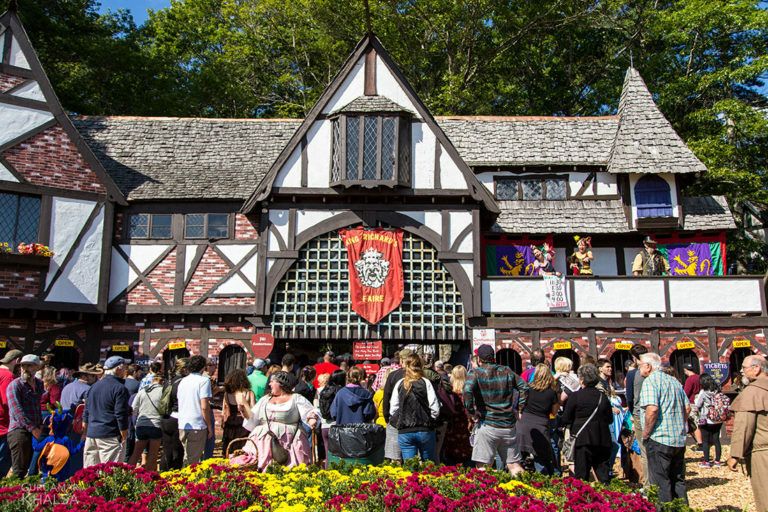 As the men and women closer to the action had more up-to-date information, he found they could make better decisions. There were exceptions, of course—like WikiLeaks, when a low-ranking soldier with access to sensitive information made it public. It’s a matter of empowering the right employees. It’s hard to tell how well McChrystal is adapting to life outside the military. He doesn’t play golf, and he doesn’t go fishing or hunting. Aside from one hiking trip to Wyoming with friends every year, he doesn’t take much time away from work. His vocation is also his avocation, he says. He likes to read, a component of writing, he says. And he likes to study businesses and talk with different leaders. 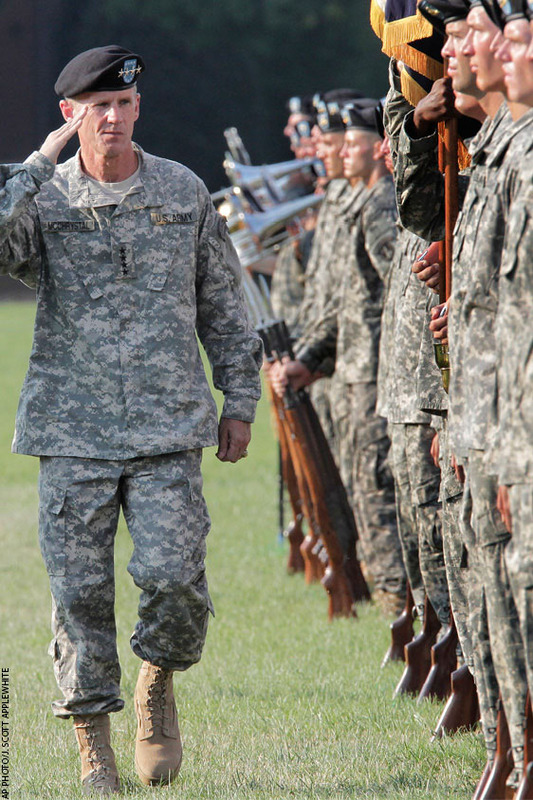 In the corporate world, there are some aggressive types—“gunslingers,” McChrystal calls them. A few are famously successful, he says, but not many. When he was in JSOC, dealing with the special operations fighters, he noticed that, on the higher teams, the men were more interested in changing their appearance—growing facial hair or wearing more civilian clothing. At some point they came to him and said they thought that wearing hats around all the helicopters might be a potential safety risk. They asked him to change the requirement inside the compound. But about six months later some of them came back to him. It seems khaki baseball hats with American flags—not military-issued—had become popular, and they wanted permission to wear them. He noted that just a few months earlier they’d told him that hats were a safety issue, that they could be sucked into the helicopter blades. Part of what makes the special operations forces so powerful is their ability to work on the margins, outside traditional rules. That powerful perception became a weapon itself: The possibility that a force of highly trained, well-armed warriors might show up anywhere in the world, at any time of day—a concept advanced by Hollywood—is a compelling reason for the bad guys not to do something they might otherwise. Indeed, he says that the opposite—a big company appearing weak—might actually inspire competition that has much less to lose. There are other lessons, other connections between the military world and the business world. But after more than an hour of talking, of explaining how much startups and terrorists have in common, McChrystal has to go. He has more writing to do.